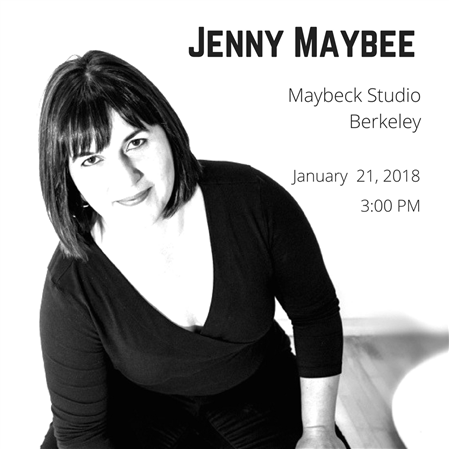 Jenny Maybee’s “eloquent and heart stopping” piano playing and vocals have been hailed as “expertly balanced,” with her voice described as “exquisite” and “in the same league” as Billie Holiday, and her piano stylings compared to Keith Jarrett, Chick Corea, McCoy Tyner, and Cecil Taylor. Jenny's most recent album, HAIKU, was lauded in the press as "a thrilling, intimate, very delicate dialogue...close to perfection," and Jenny’s composition “Winter Butterflies” was selected as one of the Top 10 New Songs of 2016. Jenny will be presenting new piano and vocal compositions inspired by her recent adventures and the landscapes of New Mexico and Hawaii. Shimpei Ogawa will join her on bass to weave a sonic landscape for the performance. Interview with Jenny Maybee & Nick Phillips about the concepts behind the album HAIKU.